Nursing college in Chandigarh Punjab The presents scenario is full of competition and people are only fighting for being the best. Education is the key through which a person could get the desired result and it can be of any field. So in this regard, specifically this content has been written for those who are willing to establish their career on nursing grounds by doing any nursing course like ANM (Auxiliary Nursing & Midwifery)or GNM (General Nursing & Midwifery). People prefer to surf for nursing college in Chandigarh Punjab and based on the result of search engine they do an internal inspection before getting admitted for the course which is really good practice and it shows the awareness towards the education. With the passage of success, the universal group of institutions has decided to groom the talents in the field of nursing hence they have started providing Bachelors degree in nursing after taking proper affiliation from the government. Well,qualified staffs are hired under whom students could be groomed in best possible manner and the way institution is delivering the resulting in the field of nursing course has made the best college of nursing in Punjab Chandigarh. By keeping the current era of competition in mind, the universal group of institutions has designed the course content through which student could get updated with the advancement in the field of nursing. The laboratory is equipped with all advanced instruments and demonstrations are being done by experts who are in the field of nursing from the past decade. We know the level competition and that is why we keep our students focused and centralized so that they could achieve the best and reputation of the nursing college in Chandigarh Punjab could get maintained. Nursing is the job of humanity where one gets a chance to take care of people like a family member. This is the most challenging job of the society where one individual needs to be active and alert because they directly deal with the health issues of patients and sometimes they do wonders in critical situations. Hence by keeping all the practical scenarios in mind, our experts organize their sessions and at the end of the training period, students get a chance to practice in hospitals as well. This has been kept in practice so that after passing out students could be aware of the real world scenario and with the increasing range of students inspires us to become in the list of the well-known college of nursing in Chandigarh Punjab. After completion of intermediate, the student can apply for a bachelors degree in Nursing which will be of 3 years course and post-completion they will become eligible to apply for government hospital or Masters in Nursing. 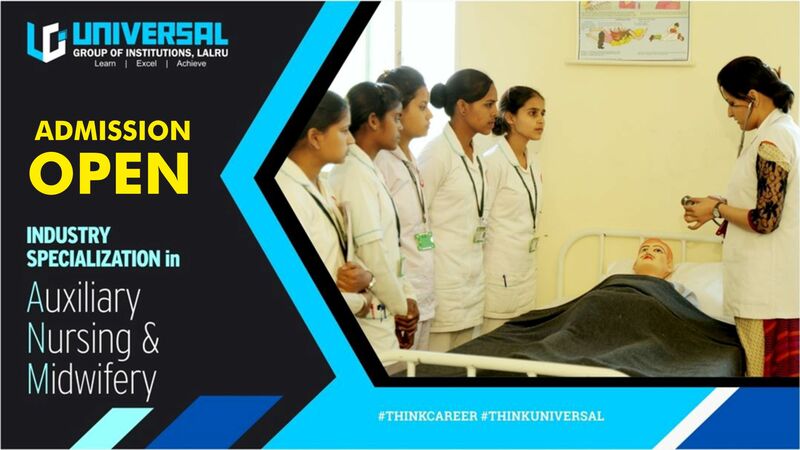 Hence if you are also looking to set your career in the field of nursing then none of the options could be best other than the Universal group of institutions who are one of the best nursing college in Chandigarh Punjab. So students, if your board exams are over and you are browsing for the nursing college in Chandigarh Punjab then join us. Our team of experts will guide you in the best possible manner. Do not think twice; just knock the door of a universal group of institutions. We will be more than happy to serve you. Keep in touch. Looking to see you soon.